Guruji Shri Narendra Babu Sharmaji has started new section in his Bruhat Brahmanda programme called Ashtadasabhuja Durga Darshana. In which Guruji reveals the details on Lalitha Sahasranamam. Guruji have divided the Lalitha Sahasranamam into 18 sections, he plays each section and reveals the Goddess Durga Temple related to it. 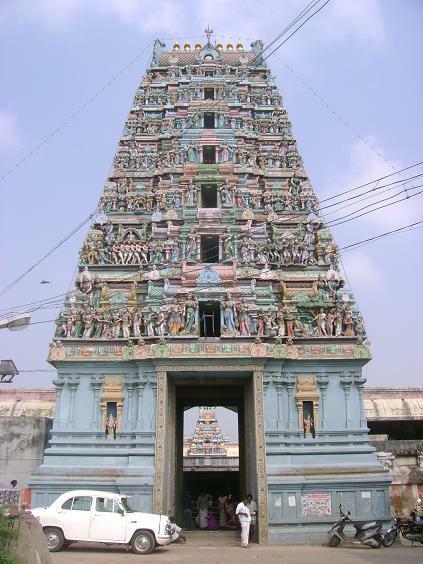 The fourteenth Temple in Ashtadasabhuja Durga Darshan is Arulmigu Devi Karumariamman Temple - Thiruverkadu. The Lalitha Sahasranama verse played by Guruji, is given below. Thiruverkadu is just 18 KM from Chennai. Bus facilities are avaliable from Chennai. One of the sportive arts of Devikarumari. One day Devikarumari took the image of old nomadic lady and went to Sun to forecast his future. Without realising her as Devikarumari, He simply neglected her. Devikarumari immediately vanished. Sun has lost it's brightness and its glory started declining. Realising his mistake He begged Devikarumari to forgive and excuse him. Sun also requested Devikarumari to celebrate Sunday as the day of Devikarumari. Devikarumari also accepted it. He also got permission from Her to pour on her sun rays twice in a year in the month of Panguni and Purattasi. So Sunday is celebrated as the day of Karumari . We can happily witness the scene of sun rays falling on the head of Devikarumari twice in a year. Once upon a time Lord Thirumal came to Thiruverkadu to witness the grace rule of Umadevi. 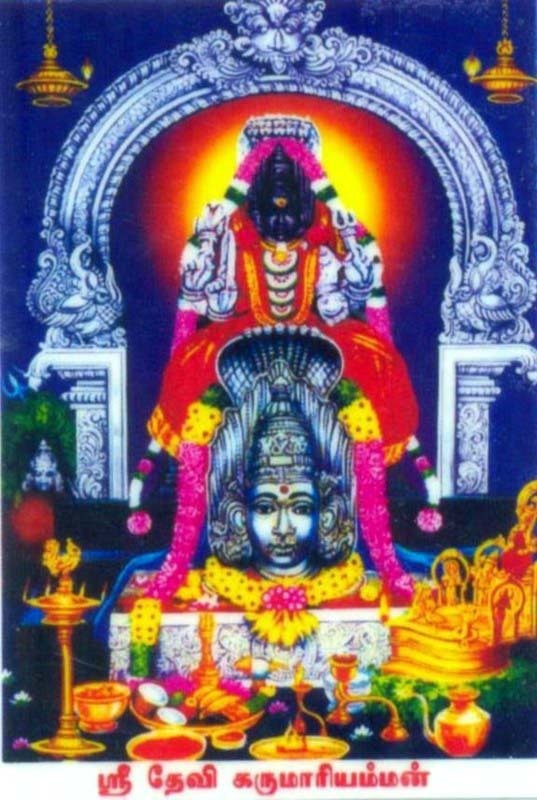 When Thirumal personally met his sister Karumari, she requested him "to seat there as Srinivasan of Thirumurai and assist Her and bless the devotees who worship Navagraham and stand towards southern direction". He was happy and promised Her, that He would sit by her side and protect the position of Nine planets. Veda Viyasar was extremely happy to see Annai Parasakthi and Lord Venkatesan together. Two sisters by name Sundari and Sarathai were in the snake world. They were having enticing beauty and they could not get suitable bridegroom . To redress this grievance they performed pooja for Kali. Narathar came there and told them the time is ripe now; so go to Thiruverkadu pray Karumari and get Her blessings. Devikarumari appeared before these sisters and instructed them "Children ! Take bath in the Sambar Poigai and drink turmeric water for one mandalam and pray Sakthi. Your grievances will be redressed and you will lead happy life". As per instructions of Devi Karumari, both the sisters performed the pooja. At the end of one mandalam princess Sambu and Balan came there and saw Sundari and Sarathai. They fell in love with each other. Sundari married Sambu and Sarathai married Balan and they lived happily for long time. Even now the turmeric of Devi Karumari blesses unmarried girls with bridegrooms and child for those who are not having children. Patients are relieved of their disease. Neem is capable of putting a fight against god of death ( Yeman). Neem leaves are slogans! They are diplomatic ! They cure many diseases !. They drive away many evils ! Devi Karumari has said "I am living in the neem leaves and it will give life". People are getting neem leaves from Devi Karumari piously. Mantras uttered With neem leaves and cane drive away bad evils and the devotees get cured. Honouring the request of Lord Siva, Karumari merged all the five elements in a kumbam and made Ganga to come out of it and sat with neem leaves. That pose can even be seen today while she blesses her devotees. Devi Karumari told "If you pray snake idol kept under Neem or white neem tree, Karumari will bless you. If you pour milk in snake anthill you will get uplift in life and the bad effect of Ragu and Kethu will be removed ". During Adi festival, pouring of milk in snake anthill is celebrated as a special event. She gave boon to five elements, made them as five headed snake and wear it on her head. Lord Siva decided only Lion Mount was most suitable for Karumari to go around the world to bless Her devotees. So mayai, "tharagan" of Lord Muruga became lion and reached Thiurverkadu. Devi Karumari was giving pose sitting on it. All are extremely happy to witness that scene on Sunday, Full moon and poosam in the month of Thai. There is reference about Thiruverkadu in Kandapuranam. The history about this sacred place has taken place in the Theertha kaadhai, Kalika kandam, Sanath Kumara shemshithai in Kandapuranam. 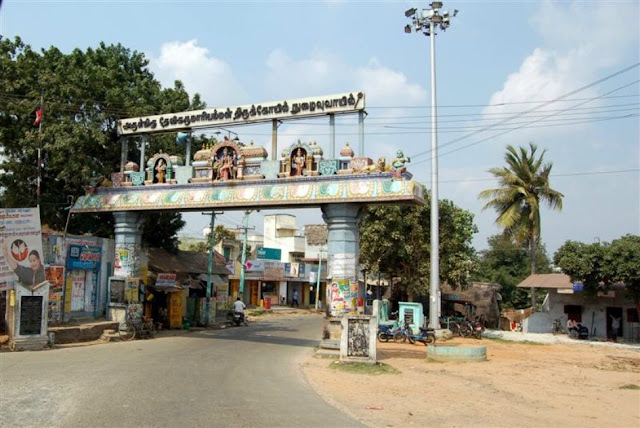 There is very high reputed history about this sacred place in the Theertha kaadhai of Kaligakandam. There are references about this holy place in the myth written by the great saint Veda Viyasar. This information can be seen as details given by the Soothaga Munivar to the saints assembled in the Naimi saranyam. Apart from the mythic history many great saints came to this holy place worshipped the deity and praised the glory of lord with their songs. Arunagirinathar and Sambandar composed many poems about this place. Sekilar Peruman in his Periya Puranam has sung about this holy place and about Moorkka Nayanar. Apart from what was mentioned in the mythics and the songs composed by the Siva saints, poor lay men every day came to this place and prayed god in their own language and style. if we compile them then the whole world will be filled with the praising words about this place, the glory of Devi Karumari and nobility of Vedapuresswarar with Balambiga. Holy lamp is the image of Adi Sakthi, the Mother of all mothers.If you lit the lamp you will have Prosperity. you should clean the lamp neatly, put the wick, pour oil, put garland and sing the song sitting before it. Then whatever you pray can be achieved. In Devi Karumari Amman Temple each and every Full moon day 108 married women will perform pooja for 108 lamps. Once upon a time Vinayagar performed Abisekam (pouring holy water) on Devi Karumari using Valampuri Conch which made Karumari extremely happy. So She blessed him when poojas were performed the first pooja would be done to Him only.That is why only after offering prayer to Vinayagar at the left side of flag staff we should go round the temple corridor. After worshipping the divine feet of Devi Karumari, who showers blessings all over the world, if you move to the right you can see the Agasthiar Sannidhi. Once there stood white Neam tree in the place of Verkanni. In due course it withered away. Now you can see a hole in the upper roof of the building as an evidence of it.